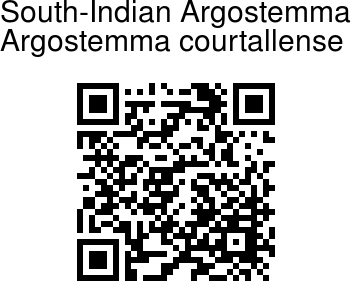 South-Indian Argostemma is an erect herb with a tuberous root stock. Leaves are up to 8 cm across, few, round, heart-shaped at base, hairy above. Leaf-stalks are 0-2 cm, stipule 8 mm long, ovate, entire. Flowers are borne in cymes 1-3 cm across, at branch ends. Peduncles are 3-6 cm long, 1-3 together. Flowers are few, 1 cm long, stalked, sepal tube turbinate, sepals 4, ovate. 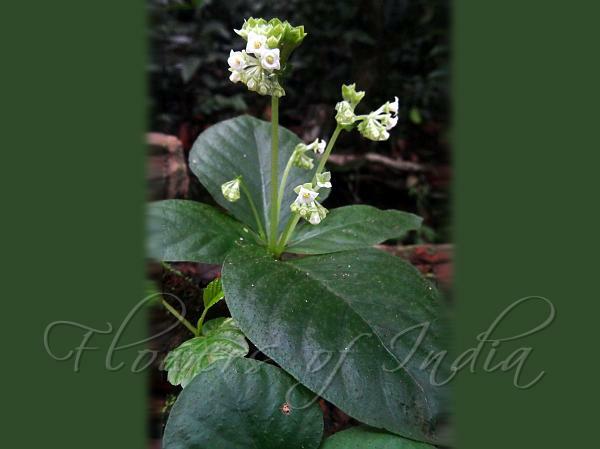 Flower-tube is broad, hairless, petals 4, ovate, white. Stamens are 4, not protruding, anthers lanceshaped, ovary 2-celled; ovules many; style slender, stigma terminal, spherical. Identification credit: Navendu Pāge Photographed in Sakleshpur, Karnataka.